Turf for public use needs to be lush and green, but at the same time tough enough to withstand heavy use without developing bare patches. C-Wise products and knowledge can help you grow turf with resilient and thick stolons able to resist tough sports use that are also green and soft underfoot. On top of this we can reduce water and fertiliser use, reduce soil borne disease, and reduce nematodes below harmful levels. This is a very fine, high maturity product designed to be ideal for topdressing high quality fine turfs. It is used on putting and bowling greens, and will meet your high standards for your turf. Spread Turf Perfect between 1 to 5mm thick onto the surface of your lawn. Water in thoroughly and use the back of a rake to rub into the thatch for heavier applications. Perfect blend is Turf Perfect mixed with cream lawn sand. The sand allows for small divots and imperfections in your surface to be filled while also getting the benefits of Turf Purfect. Apply at 10 to 100m3 per hectare (1 to 10mm thick) and drag across the turf to create a level surface. Water in thoroughly. 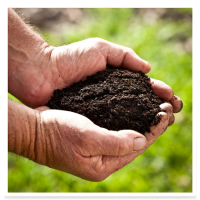 Sports is a very fine, medium maturity product that can meet your soil nutrition needs and help to improve soil health. It is ideal for topdressing short turf for ball sports. Use between 10 to 50m3 per hectare (1 to 5mm thick) applied to the surface. Water in thoroughly. Sports blend is Sports mixed with sand. The sand allows for small divots and imperfections in your surface to be filled while also getting the benefits of Sports. Apply at 10 to 100m3 per hectare (1 to 10mm thick) and drag across the turf to create a level surface. Water in thoroughly. Humiclay has all the benefits of Turf Perfect, with the addition of bentonite clay to help transform sands into more functional soils. 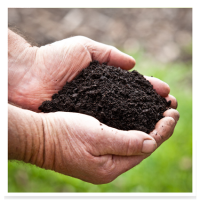 Clay can help you overcome water repellency and protect your soil’s valuable organic matter from being lost. 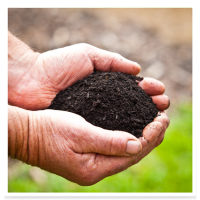 It can also support compost in storing more water and nutrients in the soil, and building soil biology. For new garden beds apply 10mm to the surface and turn in to no more than 100mm. For phosphorus sensitive natives, apply no more than 1mm thickness for any situation, or mix 1-2 cups into the planting hole of a new shrub.